Git’s great! But it’s difficult to learn (it was for me, anyway) – especially the index, which unlike the power-user features, comes up in day-to-day operation. Here’s my path to enlightenment, and how I ended up using the index in my particular workflow. There are other workflows, but this one is mine. Each of these systems has flaws. Perforce and Subversion require an always-on connection and make branching (and merging) expensive, and Perforce uses pessimistic locking too (you have to check a file out before you can edit it). I got hit by the exponential merge bug in Darcs (since fixed? ); a deeper problem was that I found I wanted to be able to go back in time more often than I needed to commute patches, whereas Darcs makes the latter easy at the expense of the former – so Darcs’ theory of patches, although insightful and beautiful, just didn’t match my workflow. Git’s problem is its complexity. Half of that is because it’s actually more powerful than the other systems: it’s got features that make it look scary but that you can ignore. Another half is that Git uses nonstandard names for about half its most common operations. (The rest of the VCS world has more or less settled on a basic command set, with names such as “checkout” and “revert”. Not Git!) And the third half is the index. The index is a mechanism for preventing what you commit from matching what you tested in your working directory. Huh? The data store that’s new, relative to every other DVCS that I know about, is the “index”. The one that’s new relative to centralized VCS’s such as Subversion and Perforce is the “local repository”. 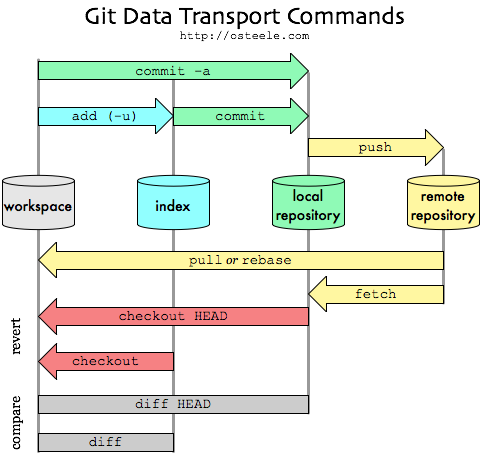 The illustration shows that “git add” is the only (everyday) operation that can cause the index to diverge from the local repository. The only reason (in Subversion-emulation mode) to use “git add” is so that “git commit” will see your changes. The -a option to “git commit” causes “git commit” to run “git add -u” first – in which case you never need to run "git add -u” explicitly – in which case the index stays in sync with the repository head. This is how the trick in “git without the index” works: if you always use commit via “git commit -a”, you can ignore the index2. So what’s the point of the index? Is it because Linus likes complicated things? Is to one-up all the other repositories? Is it to increase the complexity of system, so that you have a chance to shoot yourself in the foot if you’re not an alpha enough geek? Well, probably. But it’s good for something else as well. Several things, actually; I’ll show you one (that I use), and point you to another. But first, a piece of background that helps in understanding Git. Git isn’t at its core a VCS. It’s really a distributed versioning file system, down to its own fsck and gc. It was developed as the bottom layer of a VCS, but the VCS layer, which provides the conventional VCS commands (commit, checkout, branch), is more like an uneven veneer than like the “porcelain” it’s sometimes called: bits of file system (git core) internals poke through. The disadvantage of this (leaky) layering is that Git is complicated. If you look up how to diff against yesterday’s 1pm sources in git diff, it will send you to git rev-parse from the core; if you look up git checkout, you may end up at git-check-ref-format. Most of this you can ignore, but it takes some reading to figure out which. The advantage of the layering is that you can use Git to build your own workflows. Some of these workflows involve the index. Like the other fancy Git features, building your own workflows is something that you can ignore initially, and add when you get to where you need it. This is, historically, how I’ve used the index: I ignored it until I was comfortable with more of Git, and now I use it for a more productive workflow than I had with other VCS’s. It’s not my main reason for using Git, but it’s turned to a strength from being a liability. 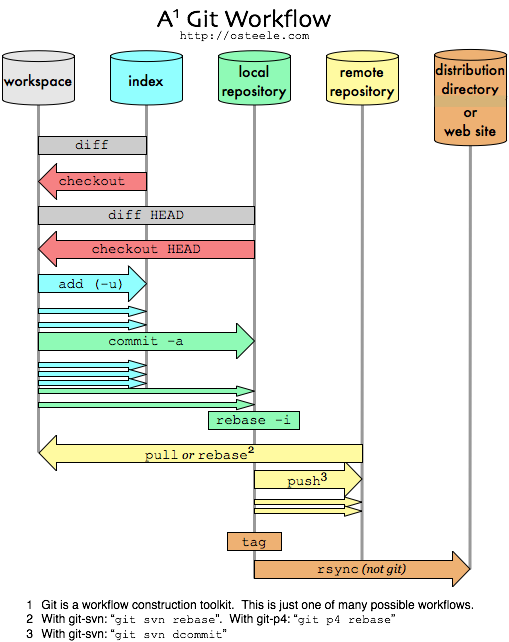 Added: By way of illustration, here’s how I use Git. I’m not recommending this particular workflow; instead, I’m hoping that it can further illustrate the relation between the workspace, the index, and the repository; and also the more general idea of using Git to build a workflow. Added: This way I can checkpoint every few minutes. It’s a very cheap operation, and I don’t have to spend time cleaning up the checkpoints later. “git diff” tells me what I’ve changed since the last checkpoint; “git diff head” shows what’s changed since the last commit. “git checkout .” reverts to the last checkpoint; “git checkout head .” reverts to the last commit. And “git stash” and “git checkout -m -b” operate on the changes since the last commit, which is what I want. I’m most efficient when I can fearlessly try out risky changes. Having a test suite is one way to be fearless: the fear of having to step through a set of manual steps to test each changed code path, or worse yet missing some, inhibits creativity. Being able to roll back changes to the last checkpoint eliminates another source of fear. Here’s another picture of the same Git commands, this time shown along a second axis, time, proceeding from top to bottom. [This is the behavior diagram to the last picture’s dataflow diagram. Kind of.] A number of local edits adds up to something I checkpoint to the index via “git add -u”; after a while I’ve collected something I’m ready to commit; and every so many commits I push everything so far to a remote repository, for backup (although I’ve got other backup systems), and for sharing. I’ve even added another step, releasing a distribution, that goes outside of git. This uses rsync (or scp, or some other build or deployment tool) to upload a tar file (or update a web site, or build a binary to place on a DVD). Ryan Tomayko has written an excellent essay about a completely different way to use the repository. I recommend it wholeheartedly. Ryan’s workflow is completely incompatible with mine. Ryan uses the repository to tease apart the changes in his working directory into a sequence of separate commits. I prefer to commit only code that I’ve tested in my directory, so Ryan’s method doesn’t work for me. I set pending work aside via git stash or git checkout -m -b when I know I might need to interrupt it with another change; this sounds like it might not work for Ryan. Neither one of these workflows is wrong (and I could easily use Ryan’s, I’m just slightly more efficient with mine); Git supports them both. There’s another way to do this particular task – of checkpointing after every few edits, but only persisting some of these checkpoints into the repository. This is to commit each checkpoint to the repository (and go back to ignoring the index – at least for checkpointing – so this might work with Ryan’s), and rebase them later. Git lets you squash a number of commits into a single commit before you push it to a public repository (and edit, reorder, and drop un-pushed commits too) – that’s the rebase -i block in the previous illustration, and you can read about it here. This is a perfectly legitimate mode of operation; it’s just one that I don’t use. Both of these alternatives harken back to Git as being a tool for designing VCS workflows, as much as being a VCS system itself. The reasons I don’t use them myself bring us to Commit Policies, which I’ll write about tomorrow.